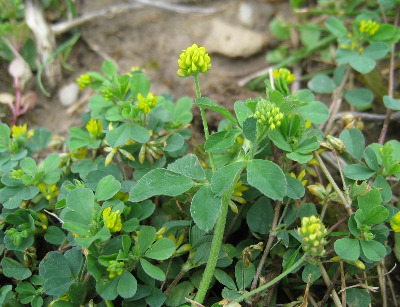 A Eurasian species, first collected in Michigan in 1870 (at Ann Arbor, Washtenaw Co.) and now a pernicious weed of roadsides, lawns, fields, railroads, grassy banks, and disturbed places throughout; invading disturbed forests and rock outcrops. Often confused with Trifolium campestre and T. dubium, but differing in its even smaller flowers, black reniform fruit not enclosed in the old perianth, square stems, and other features. Michigan specimens almost invariably have ± glandular peduncles and calyces. MICHIGAN FLORA ONLINE. A. A. Reznicek, E. G. Voss, & B. S. Walters. February 2011. University of Michigan. Web. 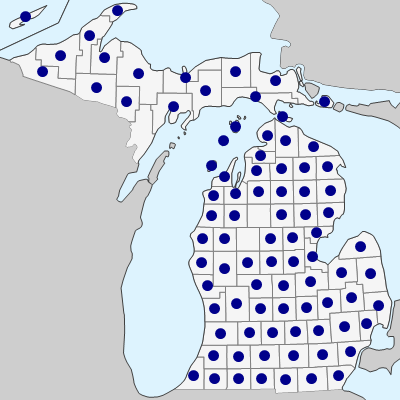 April 18, 2019. https://michiganflora.net/species.aspx?id=1330.